The other big difference between academic law and academic philosophy is that in the former there is far less consensus on scholarly paradigms than in the latter. Leiter’s adamance about the “remarkable convergence” is no small matter. He insists that there is a consensus and that the evidence for the consensus is the PGR. The criticism of colleagues, some with considerable training in statistics and survey methodology, over many years has not budged him. In his most recent remark it is clear that he’s doubling down. He cannot or will not see the circularity of his position. The PGR is philosophy and philosophy is the PGR. QED. Using the data of the 2014 PGR I show here that the consensus Leiter insists on is artificial. But make no mistake: this is not just about the PGR. 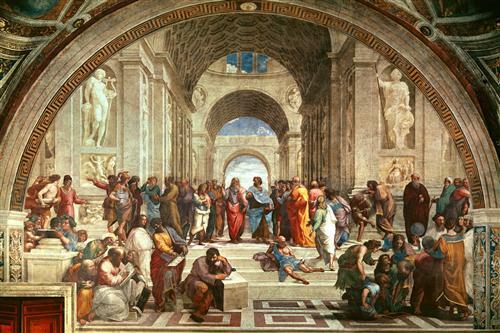 It is about whether our vision of philosophy is like Raphael’s “The School of Athens,” in which there is room for multiple and widely different ways of doing philosophy, or whether a particular style, method, and set of concerns should crowd out current and future philosophical diversity. There are too many problems with the current PGR to address in one post. This is an overview of data that call into question assumptions about the PGR’s reliability and its ostensible consensus. While I focus on the specializations here, note that the problems with this evaluator pool bear on the overall rankings because the pools are so similar. For the sake of clarity and interest, I proceed by presenting a series of issues, asking the reader to decide–without any obligation to rank them–which are worse. That the current PGR lumped together the 2011 and 2014 rankings of Feminist Philosophy, unheard of in any other specialization, because there were too few evaluators this year, and still only had 12 evaluators? Or that in the Philosophy of Language, Philosophy of Mind, Metaphysics, Epistemology, and Philosophical Logic, there are only 11 different women evaluators? Or that in the 27 other specializations not listed immediately above, there are a total of 21 women? That 72% of the specializations have 20 or fewer evaluators, up from approximately 60% of the specializations for the 2011 PGR? Or that 38% have 10 or fewer? Or that 28% have 8 or fewer? Or that 8 out of 9 areas, 89%, in the History of Philosophy have 20 or fewer evaluators, up from 6 out of 9 for 2011? That 41% of the Philosophy of Language evaluators were also Philosophy of Mind evaluators (11/27)? Or that 69% of the Philosophy of Law evaluators were also evaluators for Political Philosophy (11/16)? 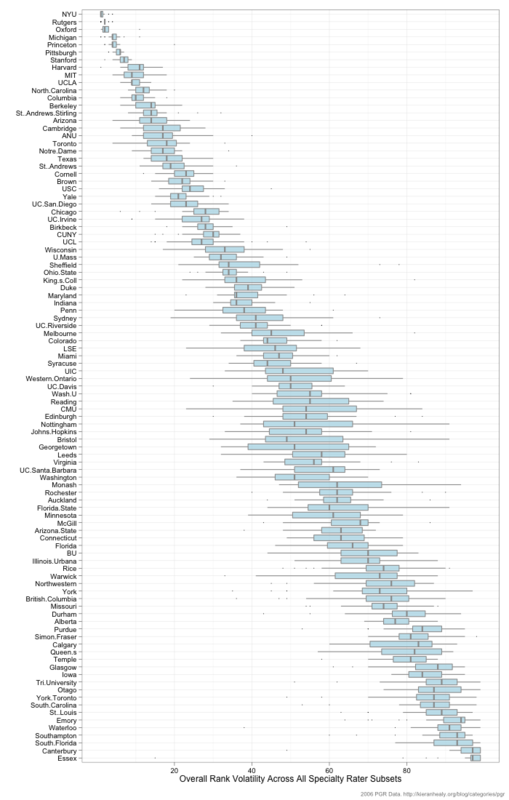 Or that 59% of Political Philosophy evaluators were also evaluators for Ethics (20/34)? Or that 79% of Cognitive Science evaluators were also evaluators for the Philosophy of Mind (22/28)? Or that 37% of Metaphysics evaluators were also Philosophy of Mind evaluators (11/30)? Or that 63% of Metaethics evaluators were also Ethics evaluators (10/16)? Or that 85% of the 20th Century Continental evaluators were also Kant or 19th Century evaluators (11/13)? Or that 46% of 20th Century Continental evaluators were also Kant evaluators (6/13)? Or that 67% of those who ranked in Medieval also ranked in Philosophy of Religion (4/6)? Or trumpeting the convergence between the specialty rankings and the overall rankings of the PGR without mentioning overlaps like these in the 2014 PGR? That only 6 evaluators in the Philosophy of Mathematics ranked 41 departments, while 39 evaluators in Ethics ranked 42 departments? Or that 7 evaluators in the History of Analytic Philosophy ranked 42 departments, while 42 evaluators in Philosophy of Mind ranked 37? Or that 10 evaluators in Applied Ethics ranked 59 departments, while 41 evaluators in Epistemology ranked 37? Or that 12 evaluators in Mathematical Logic ranked 43 departments, while 30 evaluators in Metaphysics ranked 37 departments? That the Philosophy of Religion has only 2 evaluators currently at Catholic universities—the same one, St. Louis University—effectively excommunicating a large number of philosophers who work in the Philosophy of Religion? Or that in the Philosophy of Law only 7 of its 16 evaluators, 44%, are at US institutions, for a rankings report in which the vast majority of ranked programs are located in the US, and strangely, which is spearheaded by Brian Leiter, a law and philosophy professor at a US university? Or that the Philosophy of Race has only three evaluators? Or that Chinese Philosophy only has four? Or that there isn’t any other non-Western philosophy represented, for example, Japanese philosophy, or Indian philosophy? Or that there isn’t a separate category for Latin American Philosophy? Enough. In my next post I will establish that there are evaluators who are not leading experts or experts at all in the specializations they are ranking. (I will not embarrass individual evaluators, or list names, etc.) I will also show that there are imbalances in the evaluation of specializations, for example, that eight of the experts in 19th Continental Philosophy are Nietzsche scholars, while other major figures are hardly represented–Kierkegaard gets one expert. There is also the issue of whether there are more highly qualified people who have been overlooked or dismissed because they do not fit the confines of The Consensus. [J]ealousy, hatred, and envy, spurs [sic] men to activity: not to the activity of fights of annihilation but to the activity of fights which are contests. The Greek is envious, and he does not consider this quality a blemish but the gift of a beneficient [sic] godhead . . . . The greater and more sublime a Greek is, the brighter the flame of ambition that flares out of him, consuming everybody who runs on the same course. Whatever one may think of the sentiment–or its employment in this way, or Leiter’s evident attraction to it–its invocation in a discussion of the right way to rank academic programs should give us pause. “The greater and more sublime a Greek is, the brighter the flame of ambition that flares out of him, consuming everybody who runs on the same course.” For people who see philosophy as a contest and vanquished opponents as fit for nothing but the flames, well, Leiter and his PGR are the way to go. But in “The School of Athens,” all we’d see is that this guy can really empty a room. I compiled all of the statistics in this post. Of course I may have made errors. But I do believe that any errors would be minor and not undermine the basic points or patterns under discussion. There are too many similar results. If a reader finds any errors, please notify me. 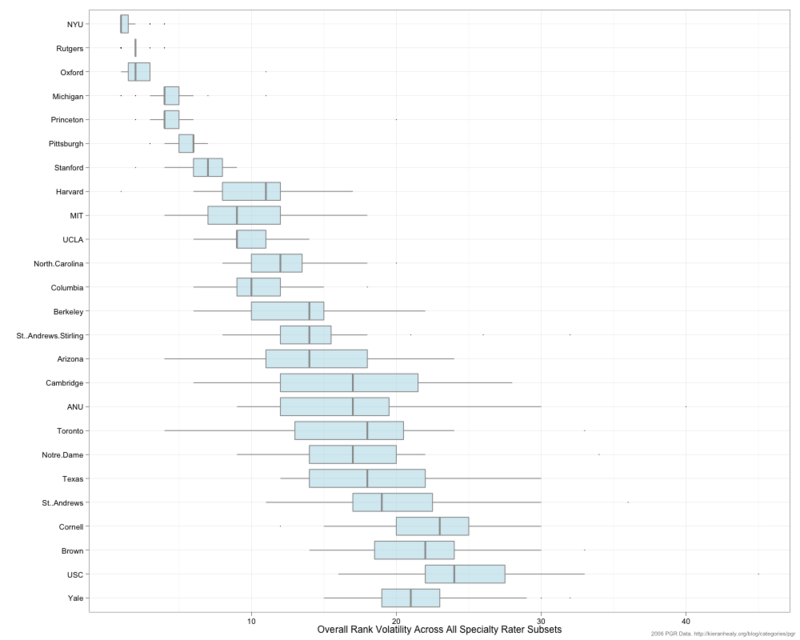 * Commenting on Healy’s work, “Ratings and Specialties,” on Leiter’s blog, Wheeler says, “Those rankings were then aggregated to see how much variation there is across the specialties, which gives a sense of how much (or how little) consensus there is across specialties. The box and whisker plots (top 25: .png, .pdf; total population: .png, .pdf) give a picture of this. Except for the top 6 departments, and a handfull rounding out the bottom, the answer is that the rankings vary quite a lot: people vote according to whom they recognize, and invariably those are the people working in their area(s) of specialization(s).” Gregory Wheeler, “Manufactured Assent: The Philosophical Gourmet Report’s Sampling Problem,” in Choice and Inference. *** It’s not as if there isn’t a wealth of experts to draw on in the US for American Pragmatism. Perhaps Leiter should consider contacting the Society for the Advancement of American Philosophy to get some names, which has hundreds of members. Oh, wait, this is one of the organizations that is outside of the consensus.